The final episode of Nisemonogatari features Koyomi confirming his own feelings before, during and after a final showdown with Kagenui and Ononoki. 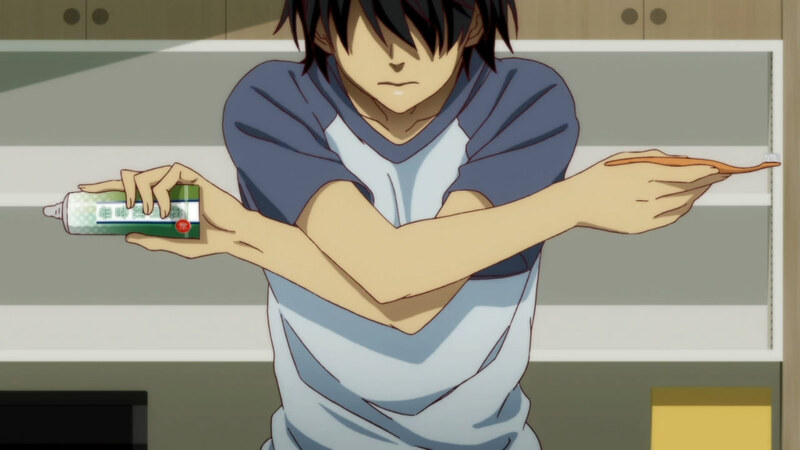 That said, he does it in typical Araragi fashion. He ultimately convinces Kagenui to move on and is thus able to keep his life the same, only without the threat to his sisters anymore. The 9th episode of Nisemonogatari continues to move along without the presence of Tsukihi in her own arc. Karen’s extremely quick character development leads her into bizarre behavior just to please Koyomi. 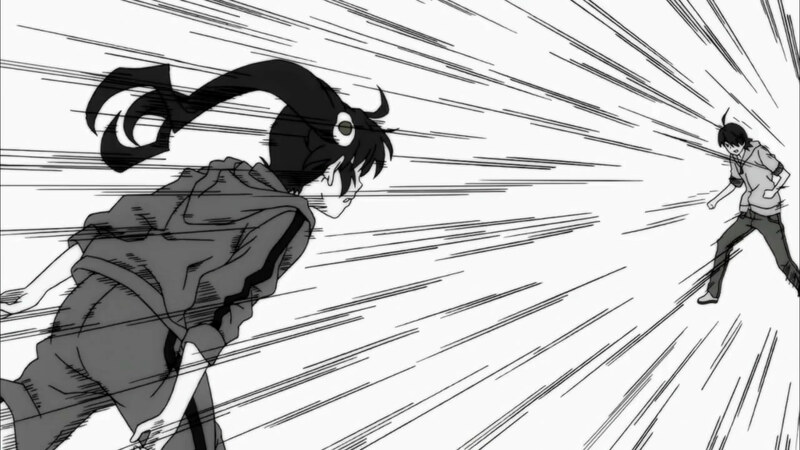 On their way to Kanbaru’s house, they encounter a new character who appears strong to Karen while Koyomi helps her oblivious to what’s happening. After Kanbaru and Karen are introduced, Koyomi runs into Mayoi for another one of their standard conversations before they are interrupted by another strong new character looking for directions. The 8th episode of Nisemonogatari takes place entirely in Koyomi’s room as Karen tries to convince Koyomi to introduce her to Kanbaru. The episode begins with some revealing background on Tsukihi at the end. However, the main action revolves around the increasingly desperate and violent attempts Karen makes in her request. Koyomi eventually relents on the condition that she goes through a challenge. Little did they know they were embarking on a journey that would cross boundaries they would never imagine. And let the violence begin. 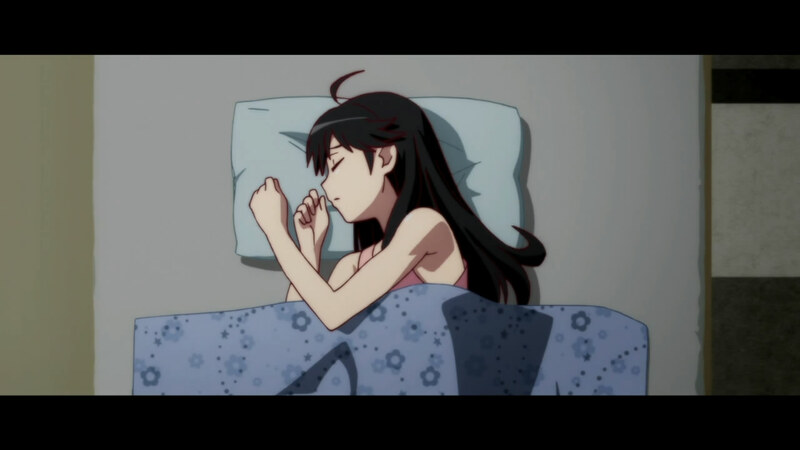 The 7th episode of Nisemonogatari sees the conclusion of the Karen Bee arc with little drama. The episode begins with Koyomi and Karen fighting over the latter’s desire to take on Kaiki and more generally her actions as part of the Fire Sisters. 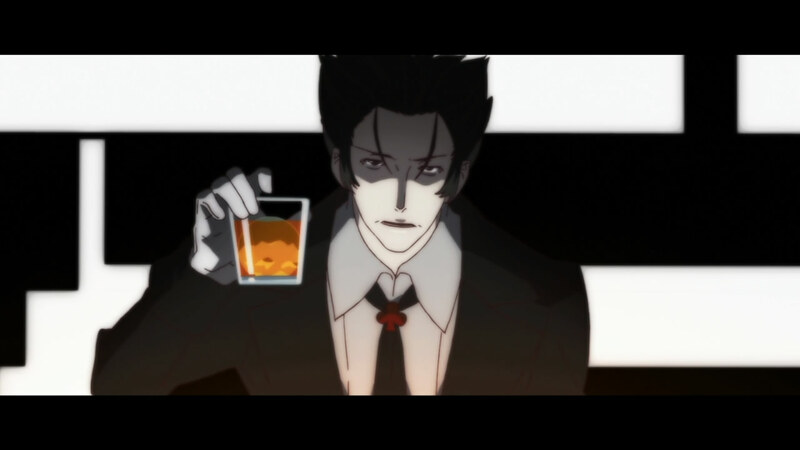 Finally, Koyomi and Hitagi confront Kaiki, who agrees to leave town and make things right. However, there’s more agreement between them than one would expect. The end of the last episode to this is conveniently omitted. Are they saving face for the protagonist? The 5th episode of Nisemonogatari takes the viewer on more of a plot driven story than any previous episode before. It begins with a conversation with Tsukihi which seems to go nowhere before the viewer is presented with a reenactment of Karen’s meeting with Kaiki. That’s followed by another conversation with Hanekawa to take her home before Koyomi returns home to take care of Shinobu. After a few minutes, he has an idea to resolve the situation, though he may have to overcome some barriers to do so. 5 seconds in and something is already amiss, though in an argument Koyomi didn't notice the obvious stress. The 4th episode of Nisemonogatari digs into the plot , however, the action continued to center around Koyomi’s relationships with the women in his life. 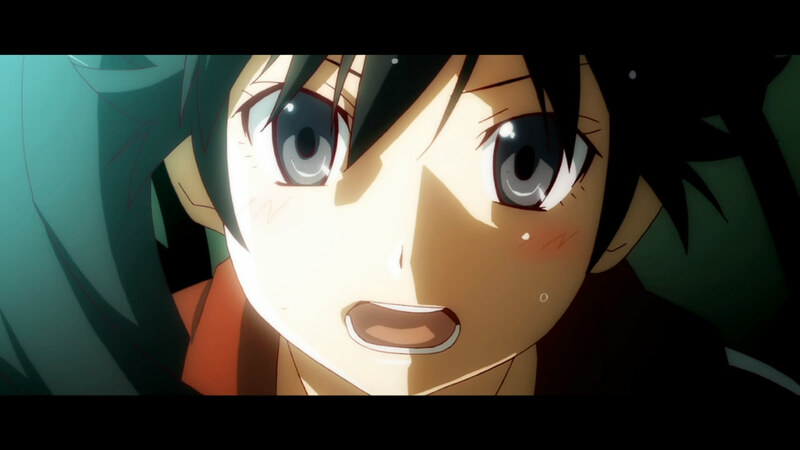 The episode begins with Karen arguing that she is fine escalating to the point where Koyomi was about to hit her when Hanekawa entered the scene. She revealed the information about Kaiki and what the sisters were up too while also messing around with him. Finally, Shinobu makes an appearance as Koyomi takes a bath. The third episode of Nisemonogatari sees the introduction of a new character, a return to the beginning location of the series and a plot that begins to move with Hanekawa looming large in the background. Koyomi finishes cleaning Kanbaru’s room before they talk some more over cards before he leaves. He immediately runs into a man named Kaiki who has a very ominous presence and much more. 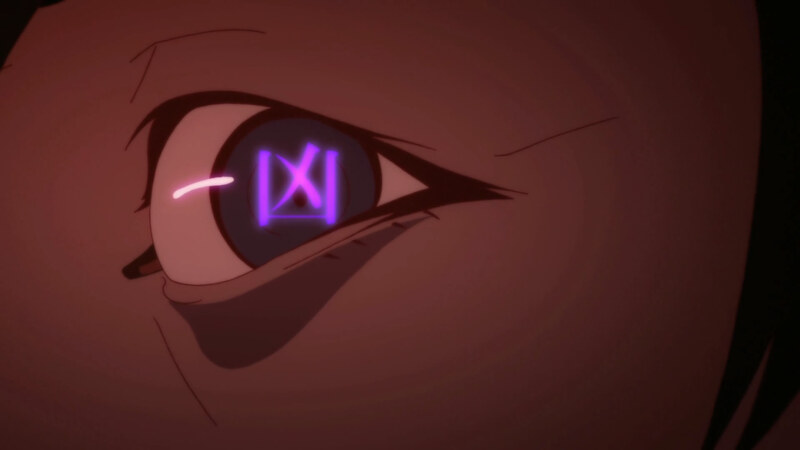 Finally, Koyomi runs into Hitagi before their usual conversational topics turn to Kaiki which ultimately led back to the scene at the beginning of the first episode. 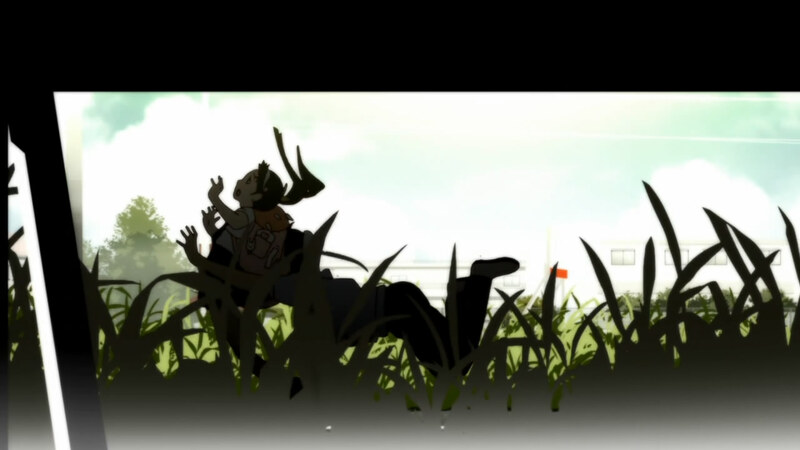 Shinbo channels American Beauty in the first minute, troubling but also adding to the image of the sisters as facades. Last week, I made a rather big deal of separating the message being conveyed in Nisemonogatari from the actual dialogue, and I shall continue to attempt to do the same this week. In this episode, we had Koyomi complete his journey to Nadeko’s house to take part in some games. Then, after agreeing to help Kanbaru help clean her gigantic pile of BL literature she ran into titular character Karen. Finally, he made it to Kanbaru’s where he was hoist by his own petard. 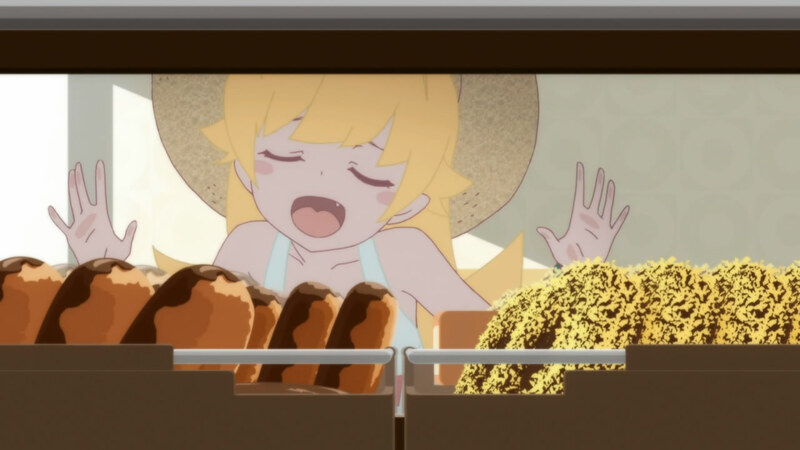 Writing on Nisemonogatari was a hard decision, mainly in that there was a lot of excellent writing on Bakemonogatari and I thought my own writing would never come close to that level. I’ve already written on Amagami and Pirates this season, so I may as well have a go with something much, much deeper than that. I also have to be willing to accept that some of my posts are going to failure. 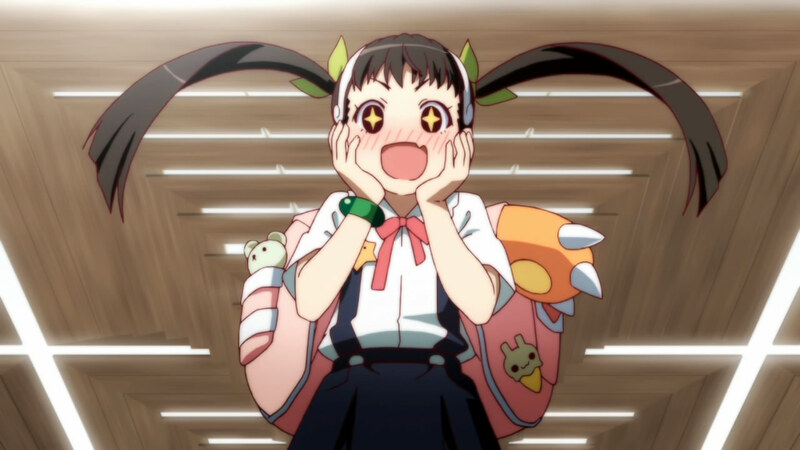 With that out of the way, I present what I thought of the first episode of Nisemonogatari. 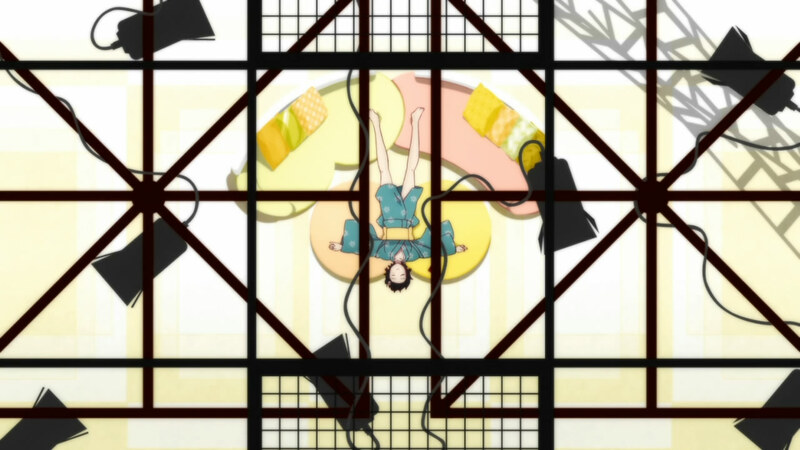 The thing that always struck me about Bakemonogatari is that the settings themselves are very post-modern, but they also add to the action that was really taking place in the dialogue between characters. There’s three of these set piece dialogues and they take place out of order chronologically, but they are really going backwards. The first of these scenes takes place last chronologically. 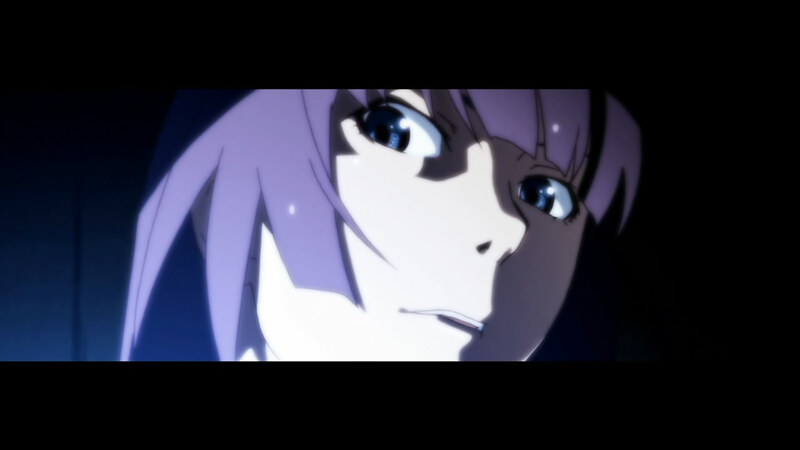 With Koyomi firmly in a relationship with Hitagi, I took their conversation to be about love itself. The setup is contrived with Koyomi handcuffed to broken down desks, but this was a fascinating conversation. 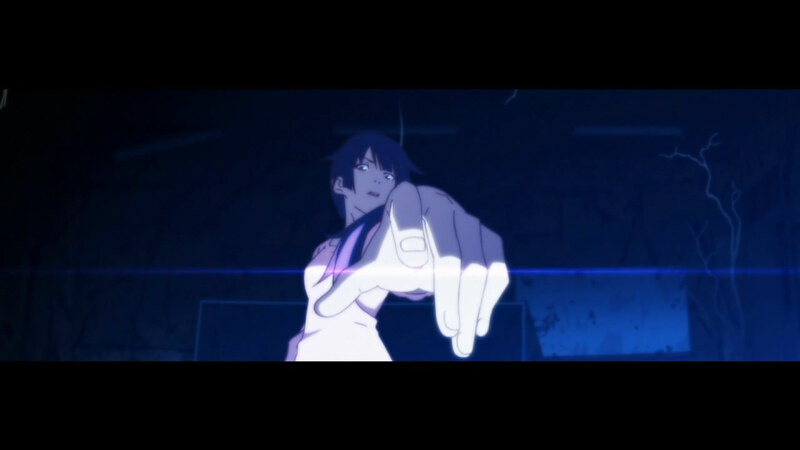 The fact that he is unable to move represents his being in a relationship with Hitagi and this was about breaking down his resistance. The lack of freedom he perceives from such a relationship has it’s advantages. She shows herself to be someone who accepts him for what he is, and though she is the one in control of the situation, she does what he asks on her terms. All Koyomi has to do is accept her love for him, an incredibly deep love, and he will have someone who fully accepts him for who he is. The second conversation is between Koyomi and his sister Tsukihi early that morning. The conversation is really about Koyomi having to deal with growing up. The key message from Tsukihi early on in the conversation is that fighting is a valid form of communication. In the past Koyomi used to fight his sisters all the time over various things as siblings do. This conversation was interesting because this was almost entirely a one-sided fight. Tsukihi seemed to be talking as though she was in the middle of an argument with Koyomi. Whether it was over the fact that he wasn’t referring to his sister’s by name or the nature of his relationship with Nadeko, it seemed like she was fighting with him. Koyomi, on the other hand, was apathetic, seemingly hiding by his own becoming a vampire to separate himself from his siblings. Tsukihi is just afraid that by rolling over he’s leaving them behind. Finally, there’s the conversation with Mayoi. The interactions between these two always provide an opportunity for Koyomi to be at his most infantile, and this was no exception. There’s the beginning where his own base feeling of hating her just drives him to do stuff that will bother her; grabbing her and kissing her in all sorts of places that aren’t appropriate given their ages. They engage in wordplay over the nature of the word courageous within Japanese as though they are kids. There whole relationship plays off like two small children in love though they don’t know it yet. Eventually, their conversation leads to Koyomi opening up about his whole situation with his sisters in a way he wouldn’t do with anyone else, except for Oshino as Mayoi puts it. This I found interesting because whenever Oshino became involved earlier, it almost absolved Koyomi of all responsibility. He became a child in his own his own mind. Perhaps his journey to Nadeko’s house, which will lead him to being handcuffed will lead him to courageously accept responsibility for his own future.